Summer is a laid-back time of year which sometimes means unannounced guests and impromptu barbeques. And at my house, those casual cookouts with friends are never complete without dessert. I have a pretty decent recipe arsenal; however, sometimes I am left scrambling for a quick and simple dessert that’s not only visually appealing, but also delicious. This recipe is just that plus it’s full of that familiar tiramisu flavor without all of the work and it’s pretty easy on the wallet. From start to finish this dessert will take you less than 20 minutes to create and they can even be made advance. Just whip them up in the morning and store them in the refrigerator until you’re ready to serve. Pretty easy, right? 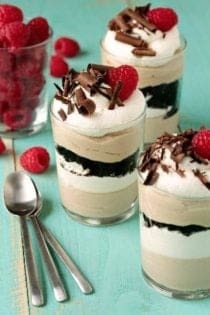 You can even serve the base recipe alone, but I decided to dress mine up a bit by combining it with chocolate cookie crumbs, freshly whipped cream, chocolate shavings and fresh raspberries. Have a great weekend and Happy Father’s Day to all you amazing dads out there! 1. Combine whipping cream and sugar in food processor bowl fitted with metal blade. 3. Combine cheese, cocoa powder, Kahlua and instant espresso granules in food processor bowl. Process until blended. Add cheese mixture to bowl with whipped cream; fold in with rubber spatula until no white streaks remain. 4. Transfer to dessert glasses. Create the Tiramisu base according to recipe directions. Layer it with freshly whipped cream and chocolate cookie crumbs. Finish them off with a sprinkling of chocolate shavings and fresh berries. - Recipe adapted from Sargento Cheese Tiramisu Custard recipe. - Recipe can be made in advance and stored in the refrigerator for up to one day before serving. - If you are not a fan of Kahlua, substitute it for 1 teaspoon of pure vanilla extract. I LOVE Tiramisu, but the ingredients are so expensive, and I can’t ever find lady fingers in the grocery store. Did you use Oreo-type cookies? Yes, I just removed the cream from them. Thanks for stopping by! Oh goodness, those are just gorgeous! Hubs will love these! The photo makes the texture look so promising and mouth watering. Such a fancy looking dessert in 20 minutes! I am sold! Bookmarked! Jamie, I think that maybe your father would probably just love this. These look fantastic. I love the fact that you used the chocolate cookie crumbs! I like the ladyfingers, but they are kind of hard to find, plus, I’ll bet the chocolate gives the dessert a deep, rich taste!! Thanks for a great recipe! What a beautiful result for such a quick dessert. So elegant too. Yum! These quick desserts are super essential to have for summer meals! Love this. This looks absolutely wonderful! And, for it to be so quick to make is an extra bonus. Talk about an impressive dessert! Your photographs are amazing. Thanks so much for posting this. You are one talented lady. These look delicious and easy and what a wow factor! Love. I LOVE this, especially how simple it is! Definitely a perfect impromptu company dessert! Oh, I love the look of these tiramisu trifles! I’m a huge tiramisu fan, but I rarely find the time to make it! I’ll be making these very soon! Tiramisu is one of my favorite desserts, and this looks so easy to make. Thanks for sharing! oh my… i just looooove all of your recipes. they all look gorgeous and nyums! can i use mascarpone instead of ricotta cheese?? Mascarpone would be absolutely perfect! I made these last night and they were a big hit! You know they are good when someone asks you to share the recipe! Thanks! That’s great to hear! I’m so happy the recipe went over so well. Have a fantastic day and happy new year! Hello, I just discovered your page and I am so inspired and now just want to get into the kitchen. I have a question, Im new at baking, in this tiramisu recipie you call for heavy whipping cream and heavy cream whipped, what is the difference? Can I use whipping cream for both? Yes, they’re the same – it’s just one is put into the recipe for the Tiramisu base while the other is simply a whipped cream layer to the trifle. You might be able to use cream cheese or thick Greek yogurt with success. can i present it in a glass bowl? Certainly you can. I think it would be beautiful. Camilla, use more vanilla extract or coffee. Ricotta cheese will yield a much different texture. I haven’t tried but let me know how it turns out if you do. This was a super easy recipe to make, and very attractive. However, it’s pretty lacking in flavor. Next time I make it I would add double the amount of espresso and kahlua. It pretty much tastes like whipped cream with cookies. I would make this again, though, with the modifications I mentioned. I also made this with gluten free chocolate cookies to make this a gluten free dessert for my son and I. Thanks for stopping by with your tips. what size are the cups in the picture? I’m looking to buy in bulk for my daughter’s wedding but not sure whether 2 oz size is too small or if I should go with 3-4 oz?? They’re definitely more along the 3-4 ounce size. I hope this helps. Love love this yummy dessert! So did everyone else!! !